www.argovian.com - Argovian Cherry Blossom "Ruby"
Mr. Barry Croft (Malcro) UK / Schweizer Clubshow 2001: Absolutely top class at this stage in the development. I honestly think I wouldn’t change anything. Extremely feminine, classic outline, wonderful quarters, perfect angulation at the rear, moving back and front is perfect, excellent coat in colour and texture for her age. At the moment I would like to take her home. She’s a cracker! Mr. Jem Swatkins (Jemsue) UK / Euroshow 2002 Kulmbach: 18 month old young lady with a super expression, dark eyes and best stop of the day. Very short muzzle, excellent bite. She stands full square, excellent rise over loin, very strong hindquarters. Moved with ease around the ring. Mrs. Jan Betts (Starjanda) UK / CAC Alsfeld 2002: Very sweet expression, beautiful well pigmented dark eyes, good skull, well arched neck into well layed shoulders, well sprung rib, excellent topline, well muscled rear with excellent bend of stifle, low set hocks which she use to drive, jacket of good colour, put down to perfection. 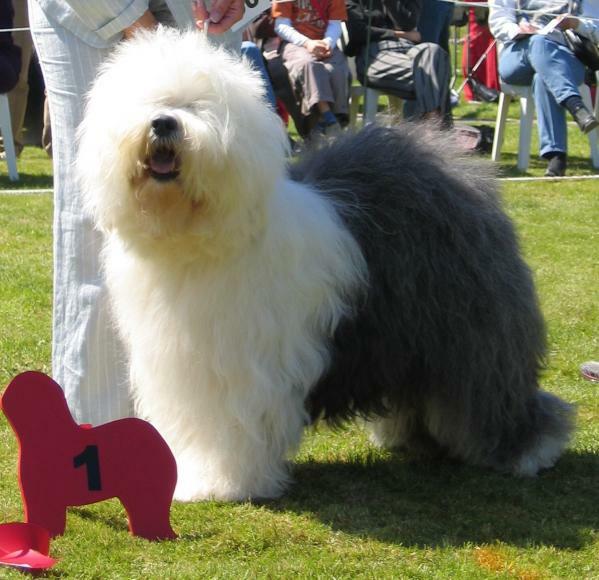 Mr. George Boothby UK / Lausanne 2004: perfect mouth, very-very good head, good reach of neck and perfect shoulders, very good bone, good shaped front, good rise, excellent rear angulation, excellent coat in colour and texture, excellent presentation. 1st class movement, tail carried correctly, lovely shape all-round. Ruby - das perfekte Showgirl, die wunderbare Begleiterin & Freundin. Welpen geboren hat und später als Oma ihren festen Platz in der Welpenaufzucht beibehielt. Ruby war ihr ganzes Leben einfach lieb, fröhlich und gesund. Jeden Abend wenn Ruhe einkehrte krabbelte sie auf meinen Schoss um ihre Schmuseeinheit abzuholen. Am 29.3.2014 mussten wir Ruby schweren Herzens gehen lassen.